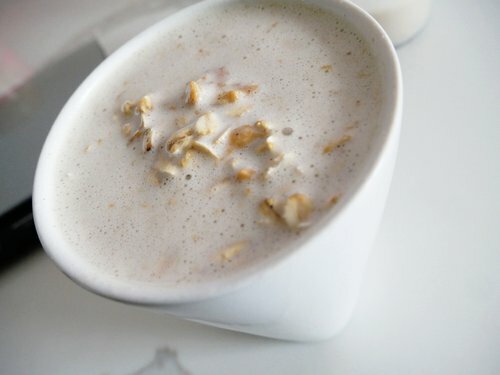 You gotta try this delicious version of oatmeal! Mouth-Watering Peanutbutter Protein Oats are packed full with ALL of the macronutrients, particularly in protein. Build muscle in the most delicious way! Continue to read for the beset peanutbutter-protein recipe! This is my go-to meal first thing when I wake up, 7 days a week. Hands down, the most delicious tasting breakfast I've ever had! It's super simple and easy to make, yet rich in flavor and nutrients. If you don't already have a digital food scale, get one ASAP! Oats have several health benefits. Filling & satiating, helps with suppressing appetite. improves blood sugar control (1, 2, 3). Packed full of fiber, antioxidants and micronutrients. Has the antioxidant vitamin E, bone-building magnesium, 208 mg of muscle-friendly potassium, and 0.17 mg of immunity-boosting vitamin B6. Can decrease your risk of heart disease, diabetes, and other chronic health conditions. For the peanutbutter lovers out there. Essential nutrients found in milk: Calcium, Protein, Potassium, Phosphorus, Vitamin D, Vitamin B12, Vitamin A, Riboflavin - B2, Niacin. Essential for bone health and vitality. Preserves muscle AND increases strength/size of muscles. Reduces stress and manages hunger. Scoop away, enhance your gains with protein. 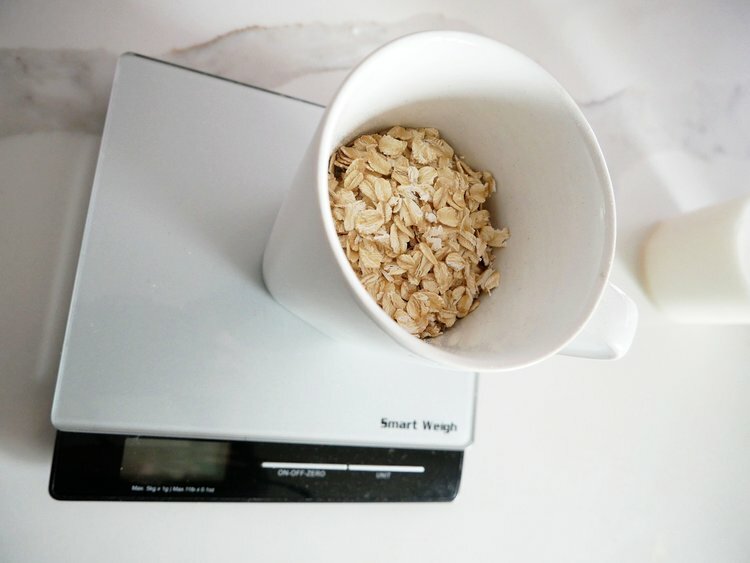 Flexible dieting involves using a food-scale most of the time. Eat what you want, when you want. No Guilt. Take two scoops of protein as shown above for maximal gains. The key to step three is to use a taller porcelain mug. 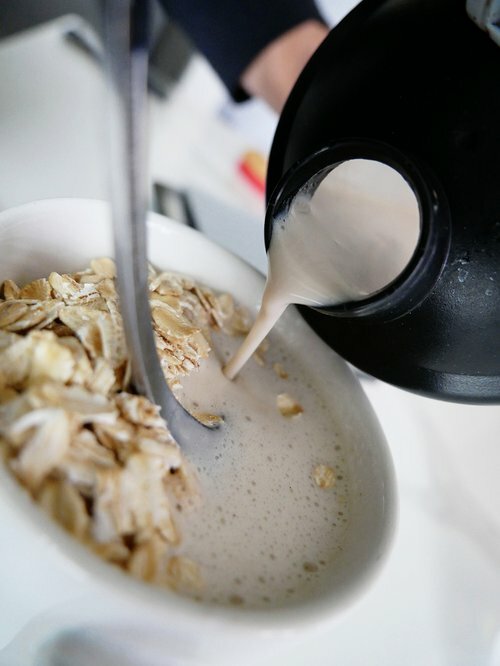 During the 1-minute microwaving/cooking process, the tall and narrow shape of the mug allows for the oats to be cooked to perfection. The best protein for performance is whey or isolate whey. The best tasting protein isn't usually whey protein. Peanutbutter has tons of health benefits. Peanutbutter, oats and whey protein. The best tasting breakfast to build muscle and start your day off right! This is what flexible dieting looks like. Count your macros and leave the guild behind. Gain muscle and eat foods you love. KEEP IN MIND, ALL RECIPES INCLUDED IN DYNAMIC KITCHEN ARE WEIGHED OUT WITH A FOOD SCALE FOR PRECISION. WE STRONGLY RECOMMEND YOU DO THE SAME FOR THE EXACT MACRONUTRIENTS AND PRECISION. LEAVE THE GUILT AT THE DOOR, HIT YOUR MACROS AND ENJOY ALL FOODS!